Kailash Mansarovar Yatra, the name says it all. I am sure, not many people know about it but for some, it’s a place to get Moksha. It’s like the final destination of the Bhole bhakts and trekkers. Kailash parvat (mountain) well known to be the abode of Lord Shiva, a majestic pyramid of rock and snow is 22000 ft above sea level. Mansarovar is the highest freshwater lake at an altitude of 15,000 ft. The peak lies in the remote western region of Tibet, which is the holiest places on earth. This is sacred to people of Hindu, Buddhist, Jain and Bon faith and considered to be navel of earth. The lake is believed to be manifested in mind of Lord Brahma, situated in the southeast region of Mt Kailash. Pilgrims take holy dip in lake and experience a spiritual revelation. Usually, pilgrims do Kora (parikrama) of the lake and Mount Kailash. The journey is not an easy feat, becomes difficult at high altitude and extreme weather conditions. However, the reward is priceless. Being devotee and die-hard fan of Lord Shiva, I have a lot of pictures pasted on my wall related to places of spiritual significance behind Shiva like Panch Kailash, Panch Kedar, Jyotirlinga etc. And Kailash frame had always been on top. Waking up every morning and looking at it is like Kailash is calling me. It’s the Kailash who calls us, not the other way round. One fine day of Oct 2017 I thought of going there, I don’t know what clicked me. But yes, I decided to go for Kailash Mansarovar Yatra coming year as the yatra runs from mid-May to September only. And by now I have made my decision to go to Mount Kailash. This was one of the major decision of my life or dream coming true. I was very happy but nervous too. So, I thought I will get some too for the company and I asked my best friend with whom I traveled a lot in the Himalayas. After many discussions on coffee, I somehow managed to convince him. I was feeling top of the world as I was supposed to live my dream with my best buddy. Now that we decided to go for trip, we started doing research on the net. Started calling to the agents who organize Kailash Mansarovar Yatra, as you cannot go on your own. You have to book the tour through a travel agent, as it requires group visa to enter in Tibet from India. I did some research on possible routes, the safest way, how to reach in less no. of days, the best time to visit and the budget off course. etc. And then after all the research, I shortlisted one tour operator based on the customer reviews. Every tour operator said the best time to travel is May-June and September. Off course I could not wait that long to live in heaven. Therefore, I booked the full-moon batch of May 2018 with KailashJourneys at 1.6 lac per person. The route I chose was from Kathmandu by helicopter with a duration of 10 days. Yes! I was very excited that my booking is done and finally I could get to see mount Kailash. From the day I made the booking, I was reading and watching youtube videos too much. I was always mesmerized by the beautiful pictures and experiences shared by pilgrims. This is the journey which represents a bond between nature and spiritual energies. One can feel the immense peace within and presence of Shambhoo all around. I even used to see dreams of me taking a dip in Holy Mansarovar. Waking up after seeing such a beautiful dream is definitely a blessing. Everything is set now. Booking done, received confirmation, dates finalized. I have been doing a lot of treks in last couple of years but, not as high as Kailash Mansorvar. So first I had to prepare myself, both physically and mentally. So I decided to do a few high altitude treks to practice. I went to Tungnath in Uttarakhand, which is at 12,000 ft and about 4.5 kms trek from Chopta. Tungnath trek gave me little confidence but, it was clear to me now that Kailash Mansorovar is not going to be that easy. Though, I gained experience from this trek and got an idea that how difficult it’s gonna be when you lose breath at altitude. 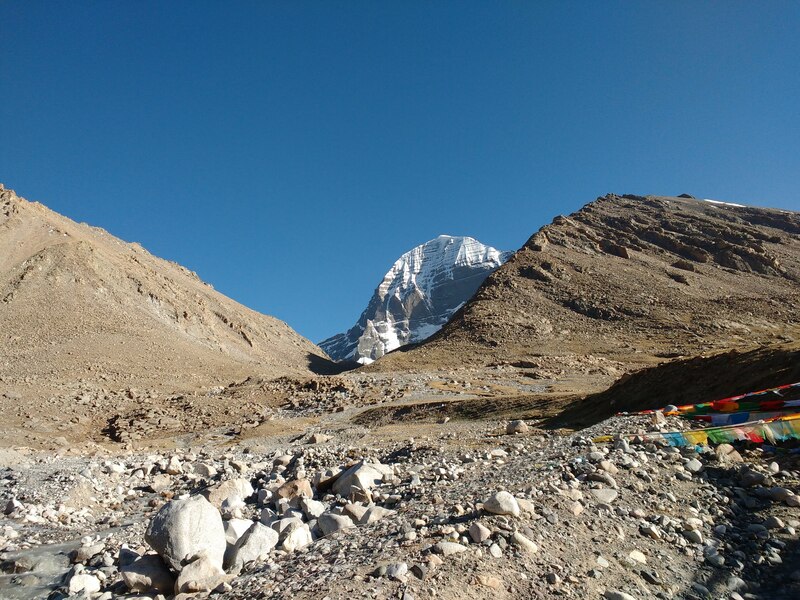 But it was just 10% of the Kailash Mansarovar trek which total trek would be of 55 kms at high altitude with unpredictable and extreme weather conditions. After coming back from Tungnath, I joined a gym and focused on cardio, strength training, legs exercises, and yoga to control breathing. It was early April when I had to complete all formalities for the trip. I called my friend for some doubt and he informed that he can’t make it because of some family emergencies. This was is least I expected. Now the negative side of my brain started working. What will happen if I go alone, never did the solo trip so will be it safe, that too on foreign land? But then the positive side of my brain stepped in and advised me to stick to the plan. It will be the group tour of Kailash Mansarovar Yatra, so I won’t be alone. There will be many like me who will come and live their dream. It was the challenge or test of determination. I prepared myself harder, did more gymming to stay fit anyhow and mentally made myself strong. I submitted all documents and made full payment to tour operator in April. But after 2 days, I got to know that there was a typo in account number and money was transferred to the wrong account. It was the agency’s mistake and so they agreed to accommodate me and confirmed my trip. I shall always be thankful to them. I had to travel on 25th May and by that time I bought all trekking gears from Decathlon with help of their experts in hiking and trekking section. Bags were packed and the excitement was on height. But one more twist was yet to come. Just before a day of journey ie 24th, I slipped in office and got hurt in tail bone and it became difficult to sit in chair. I was preparing myself for Kailash Mansarovar Yatra from months and at the last moment was going through severe pain. In front of Shiva, I literally cried to help me out, so that I can do trek at 19000 ft. I took hard painkillers and moved on. Ufff! another test to pass. I realized, it’s not easy and only selected reach their destination. I was determined to go and was not ready to give up on this. Finally, the day has arrived, all the pain has gone, all the evil thoughts have vanished and the only thing I can see was THE MIGHTY MOUNT KAILASH! With all of the problems and situations, I never thought of giving up on idea to go for Kailash. I just had one thing in my mind “Chahe kuch bhi ho, jana hai to jana hai” (No matter what happens, I will go). I was alone but not alone, was always with Shiva in one or other form. It’s all in the mind, I convinced myself. And believe me, this helped me throughout my journey. Above that, you need to be blessed by Shiva. Since this was my first international solo trip, I was very excited. I consider it to be a good start of being with myself. Was excited for the trek, nature, to be in group, make new friends and lot more. Thank you so much for your appreciation. Even I was little scared, but was amazed, when I reached Kathmandu and met the group members. Most of them were female who came alone. Its our mindset how we see other side of the world. Himalayas are always safe to travel and I have met really fantastic people on all the journeys of Himalayas. Looking forward to reading your entire journey. Yeah…you will get next post very soon. The series would be day wise starting from Kathmandu. I have experienced how it feels when the trek gets cancelled at the last moment because it has happened with me many times. And when things are bound to happen, they do in-spite of the odds! Looking forward to your next post in this series. Yeah…but this time I was determined enough that I could not cancel it anyhow. And yes, next post will be published very soon.